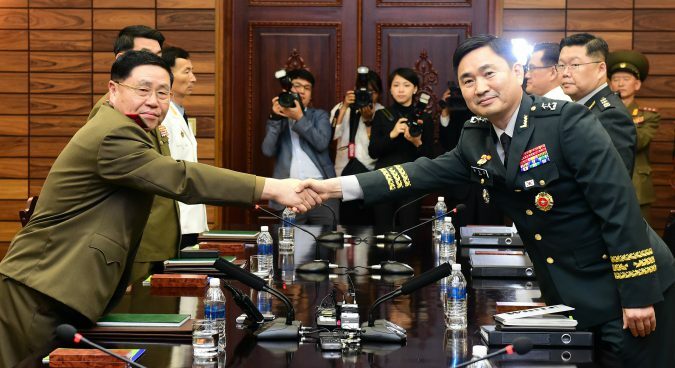 North and South Korean military on Thursday agreed to “completely restore” inter-Korean military communication lines on the east and west coast, the ROK Ministry of National Defense (MND) announced. 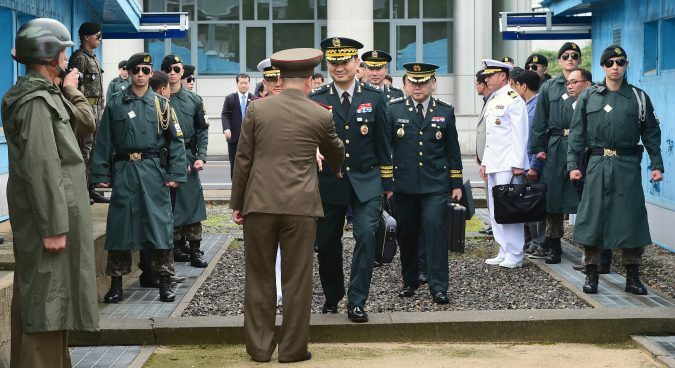 A joint press statement was issued following a day of inter-Korean general-level military talks on the Northern side of Panmunjom – the first of their kind since December 2007. The talks kicked off at 1000 KST, as part of follow-up measures to the Panmunjom Declaration signed by the leaders of the two Koreas in April. “Both sides will thoroughly implement the agreement of the inter-Korean general-level military talks on June 4, 2004 on prevention of naval clashes in the west sea,” the joint press statement read. “[Both] agreed to completely restore the military communications line in the eastern and western district,” it continued. January saw the North restore the military hotline in the west sea — previously used to regulate the entry of South Koreans into now-shuttered Kaesong Industrial Complex (KIC) — and the Panmunjom communications line. A military officer— who wished to remain anonymous — said the West Sea area communications line had been well-operated before the North unilaterally closed it in the aftermath of the KIC shutdown. The South Korean military, the source added, reportedly discovered the faults after the North restored the line in January, adding that the hotline on the western coast still needs repairs. The military communication channels in the eastern coast weren’t repaired, however, having been severed since the North’s now-defunct National Defense Commission (NDC) issued an order to block the hotline in May 2011. It is believed to have since been damaged in a forest fire. The NDC also that same day announced that Pyongyang would close its communication liaison office at Mount Kumgang. The North and South Korean militaries issued the “Agreement on the Prevention of Accidental Naval Clashes in the West Sea, the Cessation of Propaganda Activities in the Military Demarcation Line Areas & the Elimination of Propaganda Tools” following the second inter-Korean general-level military talks in June 2004. The agreement specifically laid out six measures to prevent naval clashes in the western coast, where the disputed inter-Korean maritime borders and the so-called “Northern Limit Line” is located. Despite the delegations from Seoul and Pyongyang discussing a variety of issues, the two sides only reached an agreement on two points. “Both sides agreed to continuously discuss the issues raised at the talks and to resolve them,” the statement added. Speaking at a briefing following the meeting, Kim said the North and South Korean militaries had agreed to take “effective measures” on the joint recovery of the remains of the war dead in the demilitarized zone (DMZ) – an issue also discussed at recent inter-Korean and DPRK-U.S. summits. South Korean President Moon Jae-in this month said the government would push forward with the excavation of the remains of soldiers and police who died during the Korean War in the demilitarized zone (DMZ ) “as a priority” if inter-Korean relations improved. Thursday also saw Moon and U.S. Secretary of State Mike Pompeo agree to “pursue three-way cooperation” between the two Koreas and the U.S. on the recovery of remains of the war dead and their repatriation. During a Tuesday phone call with Trump, Moon said he “would discuss with the North joint excavation among the two Koreas and the U.S.,” explaining that Seoul and Pyongyang had also agreed to implement a similar project. The general-level meeting comes after U.S. President Donald Trump on Tuesday said he would put an end to joint U.S.-ROK military drills as long as Pyongyang and Washington continued diplomacy. A military source confirmed to NK News that the surprise suspension of the joint military exercises was not discussed at Thursday’s meeting, emphasizing that the talks’ main goal was to discuss follow-up measures to the Panmunjom Declaration. Seoul and Pyongyang both dispatched five-member delegations to Thursday’s meeting. 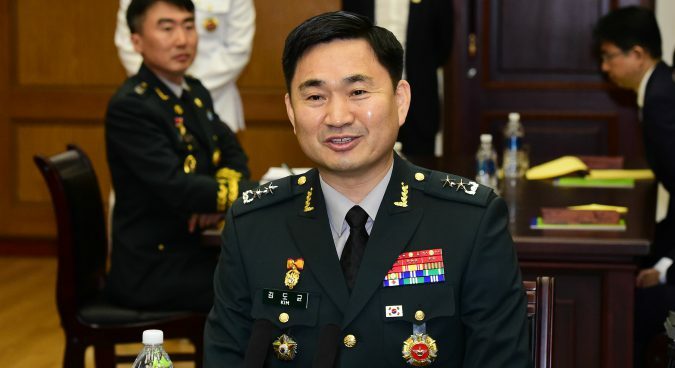 Kim Do-gyun, head of the North Korea Policy Bureau at the defense ministry, led the ROK delegation, with North Korean Army Lieutenant General of the Korean People’s Army (KPA) An Ik San – who served as chief delegate to the first and second inter-Korean general-level military talks in 2004 – served as Kim’s counterpart. There were hints at major disagreements having taken place during today’s talks: at the final round of the meeting, the North Korean chief delegate An Ik San expressed his dissatisfaction with their outcome. “I fully understand your situation, but let’s not repeat this again and be better prepared next time,” An told the South Korean chief delegate. 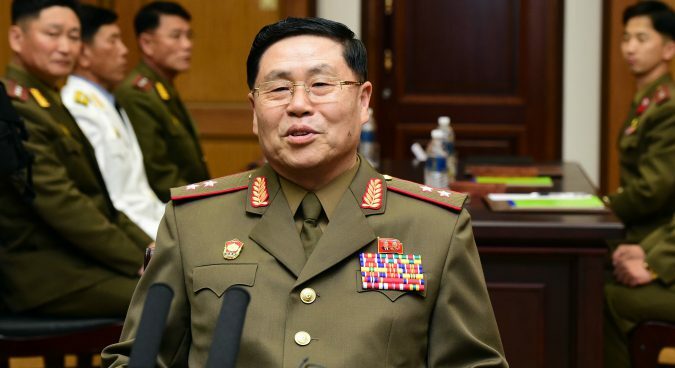 When Kim responded that discussing issues in the military field was “always a serious and difficult problem,” his DPRK counterpart abruptly put an end to the meeting. Subscribe to read the remaining 1059 words of this article.